Molestice is an all-day block party on Mole Street. Summer is officially here, which means the season of outdoor festivals has begun. This weekend, there are four festivals you'll want to have on your radar. One is an arts fest, one is a music fest, one is a food truck fest and one is a beer fest. Main Street in Manayunk will be filled with hundreds of booths selling all kinds of art on both Saturday and Sunday. And if it rains? The festival is a rain-or-shine event. 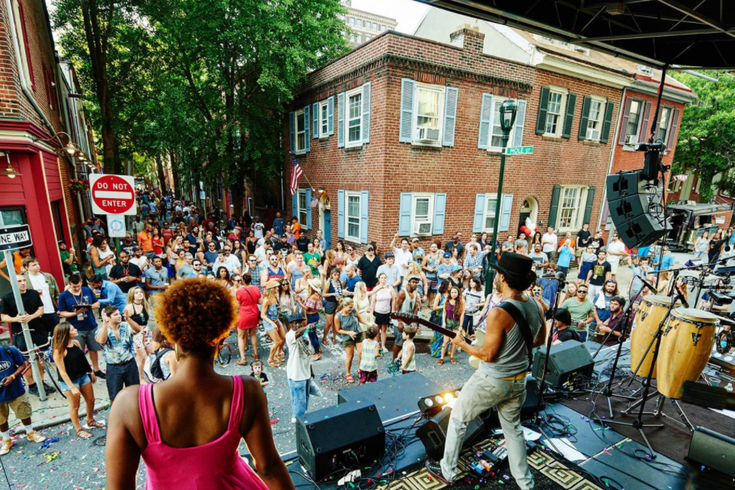 Mole Street in Center City will once again celebrate summer with a mini music fest/all-day block party Saturday. The headliner for this year's Molestice (Mole Street + summer solstice) is Nicole Atkins, who grew up in New Jersey and has been profiled in Rolling Stone. The Sea Isle City Food Truck Invitational will take place Saturday and Sunday at Kix McNutley's. Stop by for a cannoli, a fancy grilled cheese, tacos or another bite from one of the 15-plus food trucks. Nearly 50 breweries will pour unlimited samples for attendees on Saturday night. In total, there will be 100 different beers available to taste. The variety of beer is great, but the best part of this festival is getting to hang out with the zoo animals after-hours.